Edited by Forrest J Ackerman and dedicated to his lifelong friend Ray Bradbury. Gigantic book of fantasy and science fiction stories from the pulp era reprinted from AMAZING, WEIRD TALES and ASTOUNDING. A loving collection of loads of stories that amounts to 556 pages! New softcover, first edition. The complete 4 graphic novel set based on the H.P. Lovecraft stories. Told as a prequel. Produced by Adventure Comics. Cosmic horror. The complete three issue run of the graphic color comic RE-ANIMATOR: DEATH IS JUST THE BEGINNING books (#1-3). All in excellent, bagged and boarded, condition. Get all three to complete this run for one low price. Based on H.P. Lovcraft tales of cosmic horror! Six stories written by H.P. Lovecraft. Horrifying short story collection of cosmic terror. Excellent black and white, detailed illustrations. Edited by Stephen Jones. Stories: From the Dark, 6 Shots by Moonlight, Horror From the Shadows, Plague Demon, The Tomb-Legions and Scream of Death. A study of the art of the horror film and why today's films do not hold up to artistic classics. By author David Soren. Cover montage from Carl Dreyer's VAMPYR. Text and photos. 101 pages. The life and times of one of the hardest working writers ever to work in the medium of television. Insights into Rod's amazing life and accomplishments...forging the most dramatic TV show ever that was grounded in science fiction and morals. Lots of interesting background on Rod's life and loves. 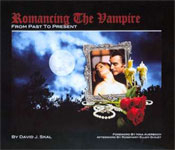 This book presents a very entertaining history of vampires, movies, and in pop culture. This book is LOADED with photos. It's more like a scrapbook than a typical book. There are lots of pockets with removable mini movie posters, stickers, photos, and maps. BIG book. A classic Scholastic paperback for young readers by famed science fiction writer Lester Del Rey. 188 pages. Used with normal age tanning, no pens marks. No one is safe from the power that reached from the stars to invade men's minds! Classic science fiction. First edition paperback from 1963. Light cover wear. Normal age tanning.